So far, I’ve come across two sources that mentioned using the new state highways (circa 1910-20) as covenient roads for cattle drives. I think it’s an interesting overlapping period. I guess up into the 1920s cattle still needed to be driven to slaughter houses or railroad termini. 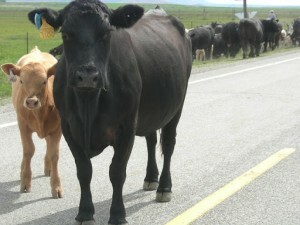 Up to that point, motorists had to wait for the cattle. At some point, the number of cars exceeded the ability of whomever was responsible for keeping the roads safe from cattle (Highway Patrol?). Both cattle and automobiles shared U.S. 101 until the 1920s, and the Highway Patrol helped decrease accidents; but as the flood of automobiles increased, the long drives through the Gaviota Pass had to be terminated. Merlyn Chesnut, The Gaviota Land: A Glimpse into California History From a Bend on El Camino Real, pg. 84 In those days, Gaviota Pass was a lot twister than it is today. In 1935, the road was straightened in one section to reduce 44 turns to 11. Prior to the improvements, drivers made the equivalent of six and one-half turns in four miles. I’m just trying to imagine rounding one of those bends and coming headlong into a cattle drive. In Cattle on the Conejo, Russell talks about making the forty-mile cattle drive from the ranch, through the San Fernando Valley, over Cahuenga Pass, to the yards in downtown L.A. He titles one chapter “El Camino Real and its Hazards for Cattle.” Which seems to be backward to me: aren’t the cattle the hazard on a highway? Not to a rancher I guess. A small percentage of motorists believed that the highway had been built for them and that they owned it. After a car had smashed into a bunch of cattle on the highway, or had approached with a wild blowing horn and no slackening of speed, we were used to having the driver say, “If you would keep your damn cattle off the highway, this would not have happened.” Practically the entire length of the road had been donated to the public by the ranchers and we knew we had as much right to use it with our cattle as the motorist did with his automobile. Sometimes poetic justice was meted out to this kind of a driver. Some neighbors were moving cattle along the highway from one field to another when a young man in a Model T roadster came along. They asked him to wait a short time, for within a few hundred feet they were turning off the road. He said, “Go to hell, I have as much right to this road as you,” whereupon he drove into the herd. Now it is very difficult for steer to stand 11p on asphalt pavement when it is cold and hard. nearly always they will slip and fall when they make a quick move. One sizable animal fell in front of the Model T. Before the driver could stop, his car was on the back of the steer, which feeling that everything was not all right, got up with a big heave. The car and its driver were pitched over a fifteen-foot embankment. The car landed right across the driver’s back. He at once commenced to yell loudly for help. The boys with the cattle went down and lifted the car off his back. Then one of them stepped up and said, “Now I am going to give you a good licking, and maybe that will teach you not to run into a bunch of cattle.” The driver begged, “I don’t need that. Just let me go and I’ll never run into another one.” Of course, it must have been a little frightening to have his car flipped over a bank while he was in it, and also a little humiliating to think that a mere steer could dismount him from his car.